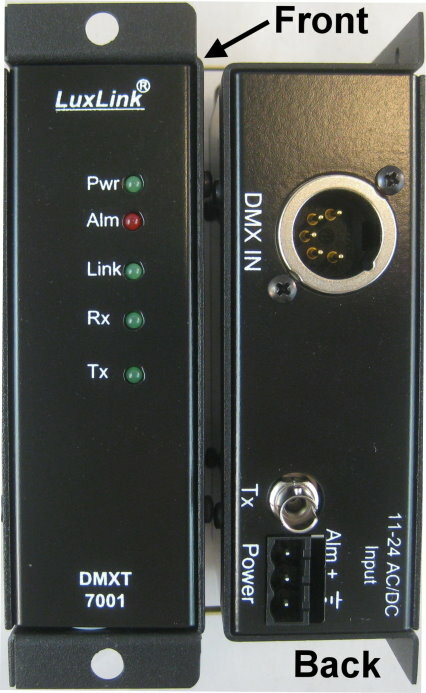 The DMX-7101 is specifically designed to transmit, receive and repeat RDM protocal over ANSI E1.11-2008 (DMX-512-A) signals at data rates from DC to 1Mb/s on a single optical fiber. The units may be used for point-to-point or in drop and repeat applications over distances of up to 20 miles. Physical Size 5.0” x 3.0 x 2.23"
For multimode fiber (~2-miles max), USA power supply. Other versions are available for single mode fiber, and other countries such as EU (European Union), UK (United Kingdom), AU (Australian) at slightly higher cost. Equipment can also be mounted in a 1U rack. DIN Rail option is also available. To specify and purchase fiber optic cable click here. For greater distances, we also have single mode fiber versions available.